The Defence Acquisition Council (DAC) headed by Defence Minister AK Antony today cleared major purchases worth more than Rs 10,000 crore. This includes thermal imagery for tanks, 44,000 light machine guns, hand-held thermal imagers, specialised homing missiles for IAF fighter jets and multi-purpose armoured vehicles. 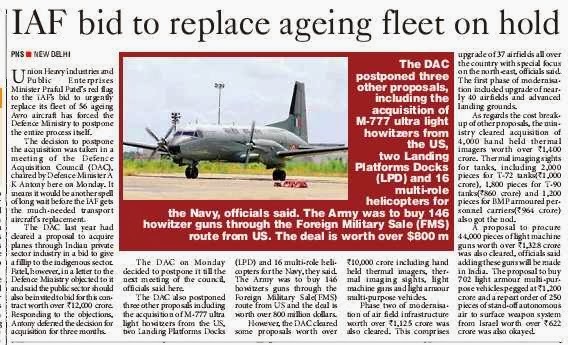 The DAC also cleared the Rs 1,125-crore project for the second phase of IAF’s modernisation of airfields infrastructure. This will cover 37 airfields. In the first phase, 30 airfields were modernised. These have been equipped with the latest radars, navigation tools and aircraft tracking systems. The DAC okayed the purchase of 44,000 light machines guns that will be manufactured in India. The Army will have 4,000 pieces of hand-held thermal imagers to be procured for Rs 1,400 crore from the public sector giant, Bharat Electronics Limited. Thermal imagers have been cleared for 1,800 T-90 tanks at the cost of Rs 860 crore. Another 2,000 tanks of the T-72 series will be purchased for Rs 1,000 crore and 1,200 infantry combat vehicles (Russian BMPs) will be procured for Rs 964 crore. The DAC gave nod to have 702 units of the light armoured multi-purpose vehicle for Rs 1,200 crore. Notably, the IAF fighter jets will get Israeli missiles that allow attacking targets from standoff range. Called the ‘Spice’ weapon guidance kit, the missile uses an imaging seeker for navigation and terminal homing. The DAC okayed 250 such pieces for Rs 622 crore. The DAC, however, deferred a decision on the purchase of 145 light howitzers, the M777, needed by the newly set up mountain strike corps. The proposal of having four specialised landing platform docks for the Navy was also postponed. The Punjab Police have arrested an Army personnel from the Hisar Cantonment for his alleged links with the Khalistan Liberation Force (KLF). Sepoy Harpreet Singh (29) of the 73 Armed Unit was arrested on February 21 on the charges of supplying a bad containing arms to the in-laws of his brother Gurpreet Singh in Sohal village of Gurdaspur district in April last year. Gurpreet, who is the KLF member, is reportedly living in England for some time. Sources said the bag contained three foreign-made pistols brought from Pakistan. While India appears to have a naval strategy, it does not as yet have a maritime strategy. It will be sometime before the country graduates from being a naval power to a true maritime power. Alfred Mahan had observed that a truly powerful nation must have a thriving international trade, a merchant fleet to carry these goods and a strong navy to protect its sea lanes. India has a thriving international trade, but only 11 per cent of its foreign trade is carried in Indian ships. Furthermore, Indian shipbuilding industry has actually declined over the years. Currently, shipbuilding in India by deadweight tonnage (DWT) is only one per cent of the total world shipbuilding, whereas China’s is 35 per cent. India’s port handling capacity is also limited although this is being augmented. As a result of inefficient port-handling capacity and lack of direct shipping links with major markets, India’s share of global shipping is only one per cent of the overall DWT worldwide. By contrast, 35 per cent of all shipping today originates from China and there are 9 Chinese ports in the list of the world’s top 15 ports, with Shanghai the world’s largest container port. A large part of India’s overseas trade has to be transhipped because of lack of adequate port handling capacity as well as regular and direct shipping links with major ports of the world. Of the transshipped cargo, 4 per cent passes through Dubai, 35 per cent through Colombo, 29 per cent through Singapore and 15 per cent through Klang (in Malaysia). The Maritime Agenda, 2010-2020 aims at building port-handling capacities to 3.2 billion tonnes by 2020. In order to encourage the building of modern ports and handling facilities, the government is allowing 100 per cent FDI under the automatic route for projects relating to the construction and maintenance of ports and harbours. There is also a 10-year tax holiday. The shipbuilding industry is similarly being incentivised through government support. The Indian Maritime University was set up as a Central University in 2008, with HQs at Chennai but campuses at Chennai, Kolkata, Mumbai, Vishakhapatnam, Cochin and Kandla. The campus at Vizag is the venue of the National Ship Design and Research Centre, set up in the 1990s to encourage innovative ship design and engineering. India also has the National Institute of Ocean Technology based in Chennai and the National Institute of Oceanography based in Goa, which provide a critical mass of advanced capabilities and trained personnel, necessary for the efficient management of India’s maritime domain. Several private sector ports and shipbuilding facilities have emerged – these include Adani, ABG, Bharathi and L&T, among others. The Ratnagiri based Rajapur yard has been recently commissioned to build a 3,00,000 tonne Very Large Crude Carrier (VLCC), the largest ever to be built in India. On the naval side, India has a blue water navy with considerable force projection capabilities, including aircraft carriers and nuclear powered submarines. India’s geographical position, its peninsular shape and its island chains, both to the East and the West, give it a uniquely advantageous position, dominating the rapidly increasing maritime traffic linking the Indian Ocean, the South China Sea and the Western Pacific. The Indian Navy is able to maintain a presence both in the Eastern and Western reaches of the Indian Ocean and as its capabilities increase so will its role as a net security provider in the Indian Ocean. India’s naval footprint is expanding precisely at a time when China, too, is emerging as a major naval and indeed, as we have seen, a maritime power. While its current focus remains on the Yellow Sea, the Taiwan Straits and the South China Sea, its footprint across the Indian Ocean is steadily increasing. There is no doubt that the Indian and Chinese peripheries are going to overlap and intersect more and more as the two emerging powers build up their capabilities. While India maintains a relative edge in naval deployments in the Indian Ocean region, this is likely to erode in the coming years as the resource and power gap between India and China continues to widen. Safeguard its coastline of over 7,500 kilometres, particularly against international terrorism. Safeguard its current and projected Exclusive Economic Zone (with the extended continental shelf) and the economic assets therein e.g. offshore oil and gas installations, deep sea mining assets and fisheries. Maintain the security of its Sea Lines of Communication (SLOC) to ensure safe passage of its ocean borne trade, which constitutes 95 per cent of our external trade by volume and 70 per cent by value. India’s energy security depends on these maritime lifelines. Over 70 per cent of India’s oil is imported and this will rise to 90 per cent by 2020. Of late, anti-piracy operations have become a significant mission. Maintain the capability to respond to maritime emergencies such as the tsunami, evacuate Indian diaspora communities in times of natural or political emergencies and conduct search and rescue operations. The Indian Navy will see a steady expansion in its capabilities and reach in accordance with the Maritime Capability Perspective Plan, 2012-2027. The share of resources allocated to the Navy in India’s defence budget is projected to grow incrementally by 7 per cent per annum. It is generally felt that the Navy should, in fact, emerge as the premier component of our armed forces, with its share of the defence budget rising from 18 per cent at present to close to 30 per cent in 10 years. The Indian Navy has a key role to play in maintaining India’s nuclear deterrent. The Indian Nuclear Doctrine posits a no-first use and retaliation only posture, which necessitates a robust triad of land-based, air-launched and submarine-based nuclear weapons and delivery systems. Of these, the sea-based deterrent is critical as it is likely to be the least vulnerable part of the nuclear arsenal. India is now close to deploying its own indigenously built Arihant nuclear submarine and a 750 km Submarine Launched Ballistic Missile (SLBM), Sagarika, will be based on the vessel. However, India will need at least three, though ideally five or six Arihant class nuclear submarines and a much longer range SLBM to be able to deploy a genuine sea-based deterrent. Naval force planning over the next decade will be focused on this indispensable component of our nuclear triad. In addition to developing and maintaining a significant naval capability, India has, in parallel, engaged in active maritime diplomacy, to enhance its maritime security. The objective is to create a positive network of engagement and cooperation with the navies of both littoral as well as user countries in the Indian and Pacific Oceans. The India Navy began holding friendly naval exercises, code-named Milan, out of Port Blair in the Andamans, in 1995. Milan began with only five countries in 1995, but in 2014, 16 navies of Indian Ocean countries took part. In 2008, the Navy also began to convene the bio-annual Indian Ocean Naval Symposium, aimed at enhancing maritime cooperation among the navies of the littoral states of the Indian Ocean. At present, there are 35 members, including South Asian, West Asian, East African and South East Asian and Australian littorals. The next symposium will be hosted by Australia at Perth later this year. In addition, India has concluded bilateral agreements with several countries to promote maritime cooperation and to consult on maritime security issues. These include the US, Japan, Australia and Indonesia. The largest number of naval exercises carried out by the US Navy is with India. This is an important statement as it reflects how India and countries in the region are responding to the new and emerging security challenges in our shared region. The littoral countries of the Indo-Pacific theatre are all dependent upon maritime trade for their economic well-being. This is particularly so in the sphere of energy security. Thus all states have a legitimate interest in ensuring the security of sea lanes which straddle the Indian and Pacific oceans, traversing the South China Sea. Countries can pursue their interests through a competitive build up of their military capabilities, in particular, their naval capabilities. Alternatively, they can work together to fashion a security architecture which provides mutual reassurance and confidence. At present, it is competitive military build-up which is more in evidence, with China displaying a worrying trend of asserting its interests through unilateral measures. This can only trigger a countervailing coalition among countries in the region and we see this already beginning to take place. Nevertheless, it is India’s preference to work together with the littoral and user states on what has now become the accepted basis for new regional security architecture i.e. “open, inclusive, transparent and balanced”. India also believes that ASEAN can play a central role as a mediating platform, reconciling the interests of the major powers in the region. The ASEAN Defence Ministers’ Meeting Plus (ADMM+) can be a useful forum for a focused dialogue on maritime security, bringing together, as it does, the defence ministers of the 10 ASEAN countries, together with counterparts from China, Japan, Republic of Korea, India, Australia, New Zealand, the US and Russia. 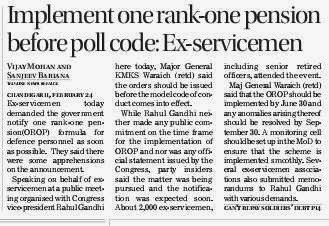 Ex-servicemen today demanded that the notification for the implementation of one rank-one pension (OROP) formula for defence personnel be issued by the government as soon as possible. They said there were still some apprehensions and lack of clarity on the announcement. Speaking on behalf of ex-servicemen at a public meeting organised with Congress vice-president Rahul Gandhi here today, Major General KMKS Waraich (retd) said that the orders should be issued before the model code of conduct comes into effect. While Rahul Gandhi neither made any public commitment on the time frame for the implementation of OROP and nor was any official statement issued by the Congress, party insiders claimed that the matter was being pursued and the notification could be expected soon. About 2,000 ex-servicemen, including senior retired officers, attended the event. 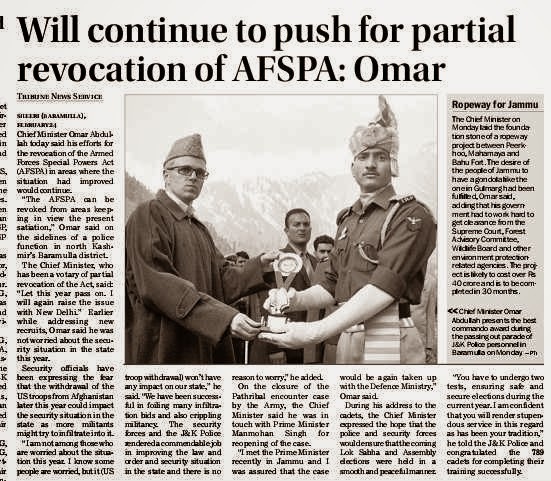 Maj General Waraich (retd) said that the OROP should be implemented by June 30 and any anomalies arising thereof should be resolved by September 30. A monitoring cell should be set up in the MoD to ensure that the scheme is implemented smoothly. India and China today decided to expand their military ties during the sixth Annual Defence and Security Dialogue here today. Maintaining peace on the border areas, addition of new levels of interaction, series of hotlines, code of conduct for their navies and meeting between respective Director General of Military Operations (DGMOs) were agreed upon in the meeting. 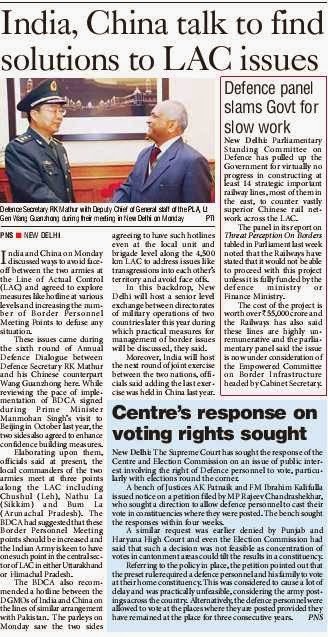 The meeting was co-chaired by Defence Secretary RK Mathur and the Deputy Chief of General Staff of the PLA, Lt General Wang Guanzhong. Sources said the two nations were keen on having at least two additional border meeting points along the Line of Actual Control (LAC). At present, there are three points - Spanggur Gap in eastern Ladakh, The NathuLa in Sikkim and Bumla in Arunachal Pradesh. On maintaining peace along the LAC, spokesperson for the Ministry of Defence said: "It has been decided that a senior-level exchange between the Directorates General of Military Operations would be held in India in 2014, during which both sides would discuss practical measures for management of border issues." 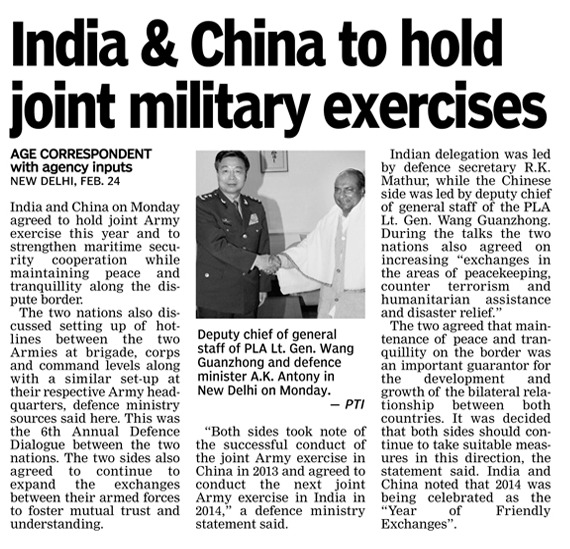 Both the sides also decided on a number of measures for exchanges and interactions between their armed forces in 2014. It was decided to conduct the next joint Army exercise in India in 2014. They discussed the possibility of having hotlines at the brigade level on either side so that the commanders, who are in-charge of their restive areas, could talk to their counterparts across the LAC. * Other measures agreed upon include strengthening of maritime security cooperation between their navies, officer exchanges and professional interactions at various levels of all services. The Indian Mujahideen (IM) allegedly established contact with the Al-Qaeda to train its operatives in terrorist activities in return for kidnapping Jews, says a charge-sheet filed by the National Investigation Agency (NIA) in a Delhi court that took cognisance of it today. The NIA had, on Thursday, filed the charge-sheet before its Special Court in Delhi against Ahmed Siddibappa, alias Yasin Bhatkal, who is one of the founders of the IM, and three others - Asadullah Akhtar, alias Haddi, Manzer Imam, alias Jameel, and Ujjair Ahmed. The charge-sheet filed last week in the NIA court of District Judge IS Mehta was the supplementary one filed in a case registered against the IM in September 2012. In the chargesheet, Yasin and the three alleged IM operatives have been charged with waging war against the country, conspiracy to terrorist acts and raising funds for the terrorist organisations. The NIA had, in July last year, filed the original charge-sheet in the case against five other alleged IM operatives, who are in judicial custody. The charge-sheet filed on Thursday showed that Iqbal Bhatkal, Riyaz Bhatkal and Mirza Shadaab Beg, some of the founders of the IM, allegedly wanted to intensify their "jihad against India with the assistance of global terrorist organisations like the Al-Qaeda and the Taliban". "They are not very happy with the ISI's control on their activities. The passion for fighting the NATO (North Atlantic Treaty Organisation) forces in the Af-Pak region by becoming part of Al-Qaeda is also motivating the IM operatives based in Pakistan, who internally want to maintain a distance from the ISI," the charge-sheet reads. Pakistan's intelligence agency, the ISI, has been funding and providing infrastructural support to the IM for allegedly carrying out terrorist activities against India, according to the NIA's investigation. The chat messages of the IM recovered by the NIA showed that Riyaz was treated badly by the ISI for trying to establish contact with the Al-Qaeda. "He refers to the ISI officials as kutte (dogs) in the chat," the charge-sheet mentions. In the chat conversation, Riyaz allegedly told Yasin that he had visited the Khyber-Pakhtunkhwa area, formerly called the North West Frontier Province, where he met a senior Al-Qaeda leader. This leader "looked after" South Asia, which includes India, Bangladesh, Burma, Sri Lanka, Maldives, Malaysia and Indonesia. "Riyaz had requested him to make him meet the main leader, Ayman al Zawihiri. But he said that he was not meeting anyone due to the fear of drones," reads the charge-sheet. For the second time in four days, supersonic surface-to-air missile, Akash intercepted and destroyed a fast moving target after it was test-fired by the Indian Army from the Integrated Test Range at Chandipur, Odisha, on Monday. The trial was conducted as part of a series of flight tests being conducted in various engagement modes from the first of the Production Model System being produced to equip two regiments of the Indian Army. 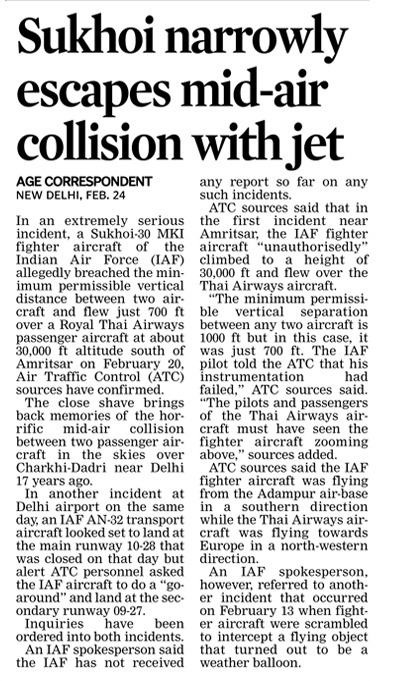 The missile hit the bull’s eye when it intercepted and destroyed a receding tow body of Pilotless Target Aircraft (PTA), Lakshya at a distance of 19 km, in a tail chase mode. 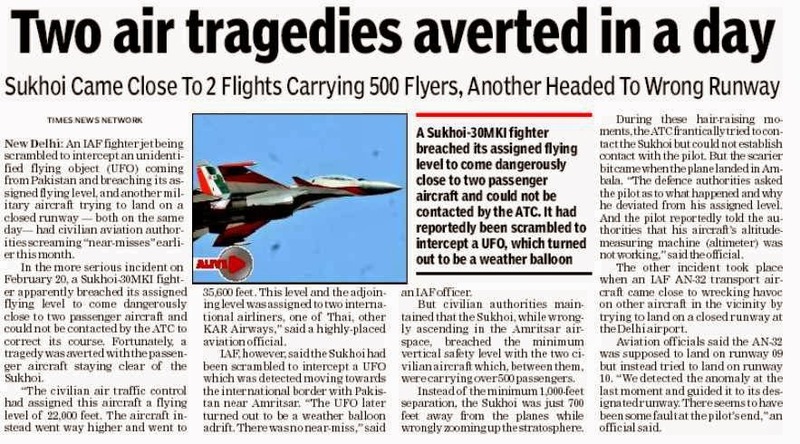 A Defence Research and Development Organisation (DRDO) press release said, Monday’s flight as well as the one conducted on Friday last when it destroyed the target in an approaching mode, fully met the mission objectives. Scientific advisor to Defence Minister, Avinash Chander, said the successful trials show the continuing excellence of Indian weapon systems. He said the development and production of Akash weapon system, with the active participation of DRDO labs, public sector units, ordnance factories, national R & D labs, academic institutions and about 200 private industries, was yet another symbol of India’s strength in making indigenous weapon systems. He congratulated the production agencies, Indian Army and DRDO team. According to G. Chandramouli, Project Director, Akash, who supervised the trial operations, the missile system performed as expected and reconfirmed its capability. He said a few more pre-induction trials were planned in the coming days. Akash is India’s first indigenously designed, developed and produced air defence system and capable of engaging several air targets up to a distance of 25 km in a fully autonomous mode of operation. It has a range of 25 to 30 km and carries a fragmentation warhead which is triggered by proximity fuze. The good acceleration of the missile provides high manoeuvrability and capability against high performance targets such as tactical strike aircraft, bombers, high altitude reconnaissance airplanes and armed helicopters. The missile’s ramjet propulsion enables the missile to cover 25 km in 35 seconds. The total production value of Akash air defence systems cleared for induction by Indian Army and the Indian Air Force is more than Rs.23,000 crore. The IAF placed order for eight squadrons and the Army for two regiments of Akash missile system. Two squadrons of equipments have already been produced and delivered to IAF and the initial production equipments for the Army were undergoing flight validation trials. The production agencies for the system are Bharat Electronics Limited and Bharat Dynamics Limited. NEW DELHI — India’s Tata Motors, along with Lockheed Martin and General Dynamics, have developed an infantry combat vehicle that could compete for India’s Future Infantry Combat Vehicle (FICV) if the program is relaunched. A Tata Motors executive said the Wheeled Armoured Platform (WHAP), based on a vehicle developed by state-owned Defence Research and Development Organisation (DRDO), fits Army requirements. Under the FICV program, which has been on the shelf for more than three years, 2,600 combat vehicles would replace about 1,400 Russian BMP vehicles at a cost of more than $10 billion. The project would be in the Make India category, meaning only domestic companies can serve as prime contractor. While FICV has been on hold, the Army still wants to buy some kind of combat vehicle. For WHAP, Lockheed and GD serve as technology partners. DRDO developed the basic frame of the vehicle, officials said, while Tata built the transmission, gear box and integrated other systems. Under FICV, the plan was for the shortlisted company or consortium to develop its own prototype while the government funded about 80 percent of the cost. Thereafter, production would be done in India by the winner. India last year rejected a Russian proposal to provide its advanced BMP-3 infantry combat vehicle along with technology transfer. Russia’s offer was conditional on India putting aside the indigenous FICV project to replace the BMP-1 and BMP-2 vehicles. The WHAP prototype is integrated with a Raytheon-Lockheed Javelin anti-tank guided missile system, fitted with a 12.7mm machine gun made by General Dynamics and is also mounted with a Norwegian-built Kongsberg medium-caliber remote turret. The US has already offered technology transfer on the Javelin and the proposal is still under consideration by the Defence Ministry, according to an MoD source. The Tata Motors vehicle weighs 22.5 tons and is powered by a 600 horsepower engine. Both wheeled and tracked forms of the amphibious vehicle are being developed. An Army official said the WHAP is close to the FICV’s specifications of weighing 20 tons and having a 25:1 ratio of horsepower per ton. WHAP also is amphibious, as required under FICV. NEW DELHI — Amid India’s quest to modernize its deteriorating state-owned ordnance factories, it is seeking help from overseas companies — a move that’s putting domestic defense companies on notice. The modernization program, which was approved last month and slated to begin in April, will involve all of India’s 41 state-owned ordnance factories and will cost more than US $2.5 billion, according to a source in the Indian Defence Ministry. The five-year modernization program is expected to create stiff competition with domestic private-sector companies, forcing them to review their strategy in tapping a weapons market valued at more than $150 billion in the next 10 years, analysts said. So far, BAE Systems has offered to modernize the ordnance factories, which are administered by the state-owned Ordnance Factory Board (OFB). A source in the Defence Ministry said BAE presented its modernization plan to senior OFB officials last month. A BAE executive here said themodernization plan will help increase productivity and reduce manufacturing waste. He gave no details. An OFB official said that while the organization is seeking help from overseas firms, no formal agreement has been reached so far. The official said the OFB is evaluating BAE’s offer. The five-year plan to modernize OFB factories includes the replacement of old machinery at a cost of more than $1.5 billion, and another $1.5 billion will be spent on modern production gear. More than 50 percent of India’s state-owned ordnance factories need replacements of either the plants or their machinery, and nearly 16 of them were operational during World War II, providing the allies with arms and ammunition. An Indian Army official said the majority of the products manufactured by OFB are second generation and often substandard. The ordnance factories produce the Russian-designed T-72, T-90 and homemade Arjun tanks, along with armored personnel carriers, mine-protected and bulletproof vehicles, artillery, naval guns, night vision devices, fire control systems for armored vehicles, small arms and many varieties of ammunition. The factories mainly produce non-high-tech arms and equipment based on technology and drawings provided by India’s Defence Research and Development Organisation (DRDO), an OFB official said. “In such an environment, the ordnance factories had no appreciable role in the pre- and postproduction functions,” the OFB official added, saying the factories would benefit from greater participation in preproduction, including the design and development of weapons. Besides DRDO, Russia continues to be the largest supplier of defense technology to the factories, but new sources need to be sought, the official added. The OFB has a spotty history when it comes to striking deals with overseas firms. In 2012, OFB signed a joint venture with Rosoboronexport and Splav SPA of Russia to manufacture five types of Smerch munitions in a new facility inside an existing factory, but the facility has yet to be built. Three years earlier, Israel Military Industries (IMI) signed a $240 million agreement with India to build five artillery munitions factories for OFB. However, IMI was later blacklisted for allegedly using bribes to win the contract with OFB. The MoD has been critical of OFB delays. The MoD source said OFB was late in delivering jackets, boots and parachutes worth more than $200 million, and the Army had to resort to imports. OFB, with more than 100,000 employees, has annual sales of only $2 billion. Last year, an inquiry found that faulty OFB-supplied ammunition led to the bursting of the barrel of a 155mm/45-caliber gun being upgraded by one of the factories, the MoD source said. The aggressive plan to modernize OFB factories comes at a time when India’s private defense companies are putting up facilities to tap the market. “The private-sector defense companies will have to redraw their plan if OFB factories modernize with the help of major overseas defense companies, as these factories could pose a major competition to the emerging private-sector defense companies,” said retired Maj. Gen. Mahindra Singh. However, a senior executive with privately owned Larsen & Toubro said private defense companies have invested more than $6 billion in setting up production facilities. He further noted that OFB’s modernization will not limit private-sector defense orders, and there is enough room for everyone to win a slice of the defense market. Commenting on the controversy over an alleged coup attempt by the Indian Army in January 2012, defence minister A K Antony recently said that he had full faith in the military forces. "There isn't the remotest chance of a military coup in the country," he said confidently. This is different from saying that even if a chief of army staff (COAS) in India desires to orchestrate a coup, it will not be possible. Unfortunately, Antony is not the only one oblivious of this reality. Even defence experts, while discussing the alleged coup, seemed ignorant about this single most important fact. Had they known, they would have shredded the coup fantasy to smithereens when the "news" first broke in April 2012; and it would not have resurfaced now. 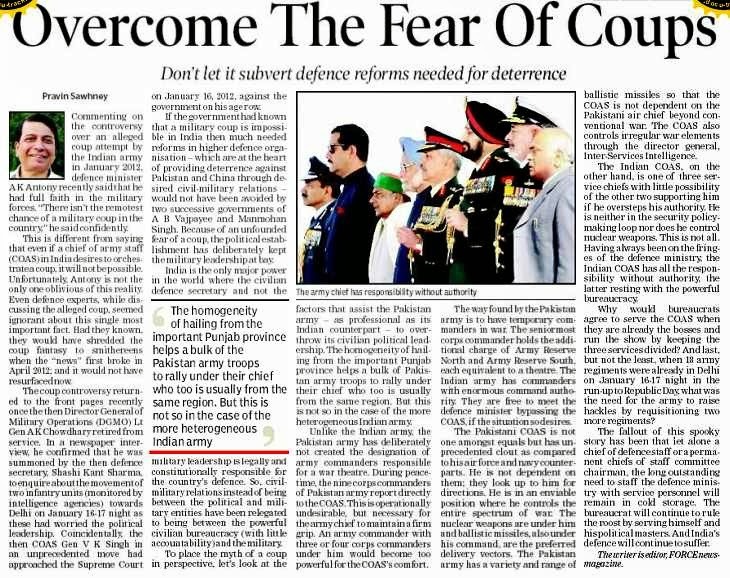 The coup controversy returned to the front pages recently once the then Director General of Military Operations (DGMO) Lt Gen A K Chowdhary retired from service. In a newspaper interview, he confirmed that he was summoned by the then defence secretary, Shashi Kant Sharma, to enquire about the movement of two infantry units (monitored by intelligence agencies) towards Delhi on January 16-17 night as these had worried the political leadership. 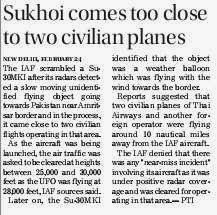 Coincidentally, the then COAS Gen V K Singh in an unprecedented move had approached the Supreme Court on January 16, 2012, against the government on his age row. If the government had known that a military coup is impossible in India then much needed reforms in higher defence organisation — which are at the heart of providing deterrence against Pakistan and China through desired civil-military relations — would not have been avoided by two successive governments of A B Vajpayee and Manmohan Singh. Because of an unfounded fear of a coup, the political establishment has deliberately kept the military leadership at bay. India is the only major power in the world where the civilian defence secretary and not the military leadership is legally and constitutionally responsible for the country's defence. So, civil-military relations instead of being between the political and military entities have been relegated to being between the powerful civilian bureaucracy (with little accountability) and the military. To place the myth of a coup in perspective, let's look at the factors that assist the Pakistan army -as professional as its Indian counterpart - to overthrow its civilian political leadership. The homogeneity of hailing from the important Punjab province helps a bulk of Pakistan army troops to rally under their chief who too is usually from the same region. But this is not so in the case of the more heterogeneous Indian army. Unlike the Indian army, the Pakistan army has deliberately not created the designation of army commanders responsible for a war theatre. During peacetime, the nine corps commanders of Pakistan army report directly to the COAS. 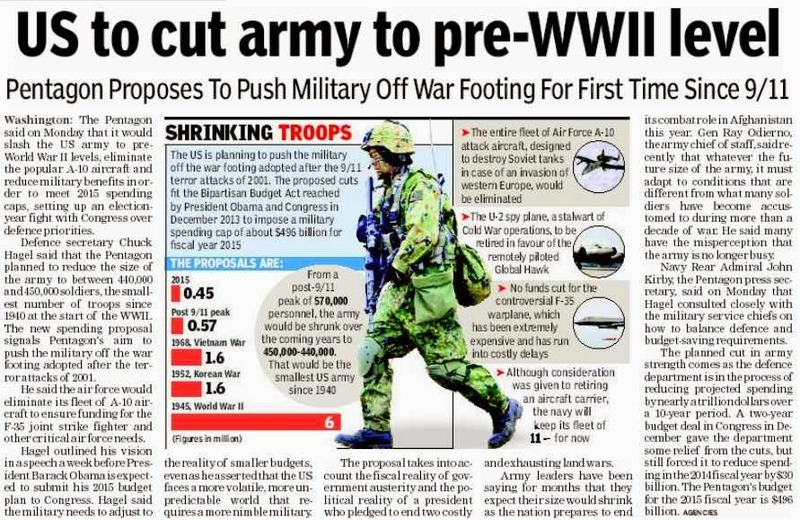 This is operationally undesirable, but necessary for the army chief to maintain a firm grip. An army commander with three or four corps commanders under him would become too powerful for the COAS's comfort. 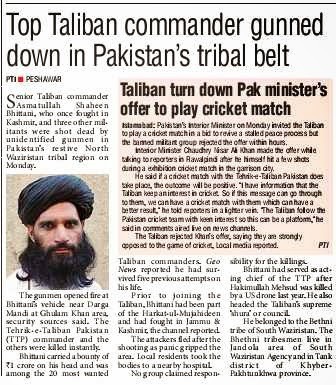 The way found by the Pakistan army is to have temporary commanders in war. The seniormost corps commander holds the additional charge of Army Reserve North and Army Reserve South, each equivalent to a theatre. The Indian army has commanders with enormous command authority. They are free to meet the defence minister bypassing the COAS, if the situation so desires. The Pakistani COAS is not one amongst equals but has unprecedented clout as compared to his air force and navy counterparts. He is not dependent on them; they look up to him for directions. He is in an enviable position where he controls the entire spectrum of war. The nuclear weapons are under him and ballistic missiles, also under his command, are the preferred delivery vectors. The Pakistan army has a variety and range of ballistic missiles so that the COAS is not dependent on the Pakistani air chief beyond conventional war. The COAS also controls irregular war elements through the director general, Inter-Services Intelligence. The Indian COAS, on the other hand, is one of three service chiefs with little possibility of the other two supporting him if he oversteps his authority. He is neither in the security policymaking loop nor does he control nuclear weapons. This is not all. Having always been on the fringes of the defence ministry, the Indian COAS has all the responsibility without authority, the latter resting with the powerful bureaucracy. Why would bureaucrats agree to serve the COAS when they are already the bosses and run the show by keeping the three services divided? And last, but not the least, when 18 army regiments were already in Delhi on January 16-17 night in the run-up to Republic Day, what was the need for the army to raise hackles by requisitioning two more regiments? The fallout of this spooky story has been that let alone a chief of defence staff or a permanent chiefs of staff committee chairman, the long outstanding need to staff the defence ministry with service personnel will remain in cold storage. The bureaucrat will continue to rule the roost by serving himself and his political masters. 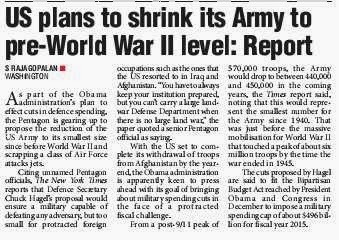 And India's defence will continue to suffer.